South Africa fielded the same side for the third match in the row and captain AB de Villiers said it was an important win ahead of the World Cup next month. EAST LONDON: On a pitch which captain Jason Holder admitted held no terrors, the West Indies collapsed to 122 all out and suffered a humiliating nine-wicket defeat in the third one-day international against South Africa at Buffalo Park today. Marlon Samuels made 26 but no other West Indian batsmen reached 20 in a dismal performance on a good pitch. Man of the match Vernon Philander took two wickets inside the first two overs and finished with three for 27, while leg-spinner Imran Tahir claimed a career-best four for 28. South Africa needed just 24.4 overs to complete a series-clinching win. Hashim Amla took his tally for the series to 280 runs for once out with an unbeaten 61 not out, while Faf du Plessis made 51 not out. It was another crushing defeat for the West Indies following a one-sided encounter in the second match in Johannesburg last Sunday when South Africa made 439 for two on the way to winning by 148 runs. "We batted poorly," said Holder. "The pitch was a little slow but there was nothing wrong with it." Holder said the senior players in the side had not yet performed as they should have done. "We need to show pride in the last two games now," he said. It was no surprise that the West Indies batted first on a dry pitch expected to get slower and lower in the second half of the match, especially after the punishment their bowlers took after South Africa were sent in to bat in Johannesburg. But the tourists were in trouble almost immediately and were unable to mount any substantial partnerships. Philander had opening batsmen Dwayne Smith and Chris Gayle caught behind inside the first four overs and fast bowler Dale Steyn followed up with the wickets of Narsingh Deonarine and Denesh Ramdin as the West Indies stumbled to 43 for four. Samuels looked the one batsman capable of playing a major innings before he was caught on the long-off boundary off Tahir. The South Africans were batting before the scheduled supper break and needed just an hour afterwards to secure the win. 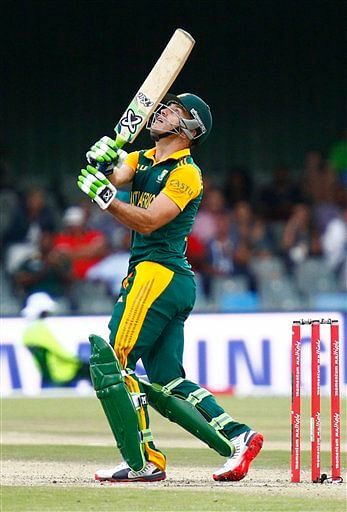 Amla cruised to his 61 off 63 balls with nine fours, while Du Plessis profited from two dropped catches in making his runs off 71 balls.